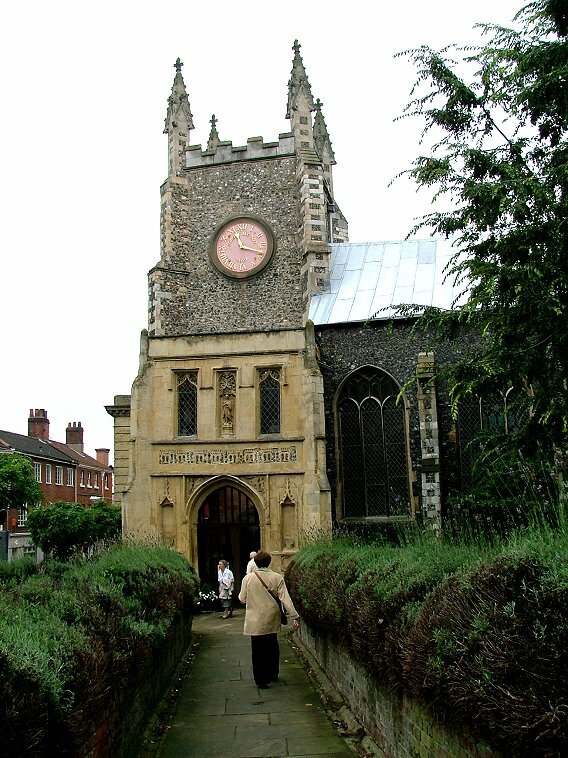 The most elegant and beautiful topping out of any Norwich tower - but what a squat little tower it sits on! 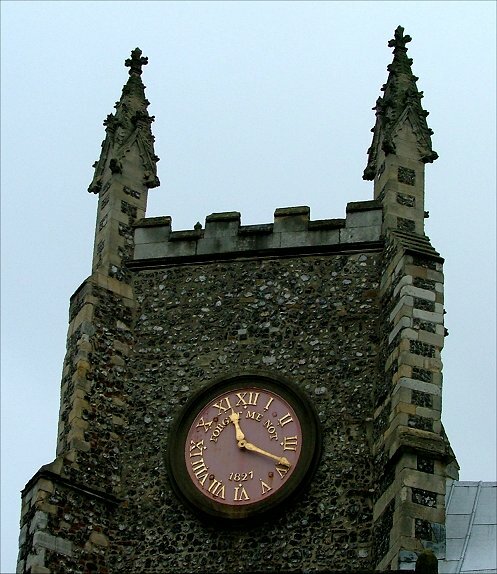 It is as if the church was shrugging its shoulders. 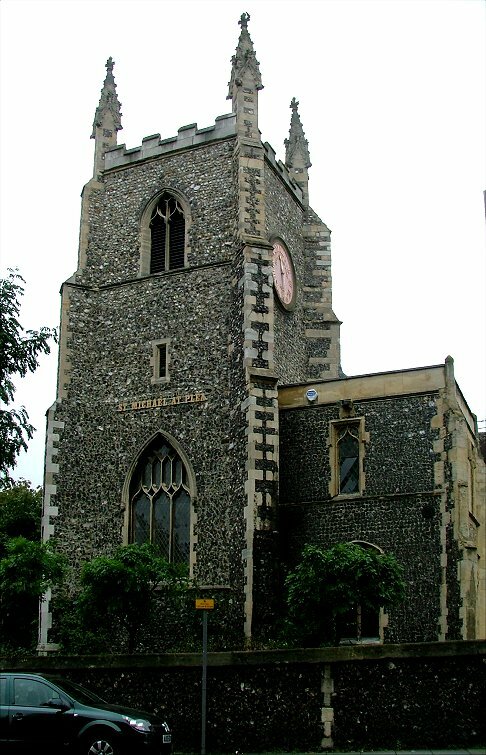 In fact, the battlements and spirelets date from a 19th century restoration, and the tower had been lowered for safety reasons below the bell stage at some time before that; the clock, which reminds us Forget Me Not, is dated 1827, which is too early for the spirelets, and in any case a lithograph from a year or so later shows the truncated tower with a cupola. Probably, it was a quick-fix 18th century solution. 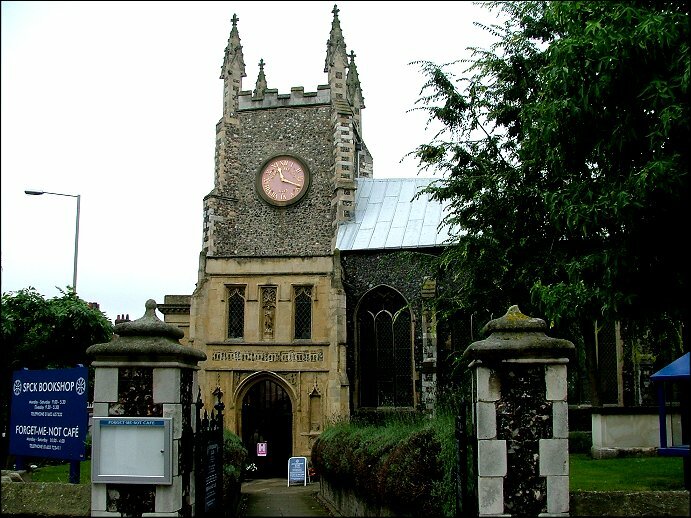 St Michael sits beside a busy road about fifty yards from St Andrew, and not much further from St Peter Hungate and St George Tombland, so it is no surprise that it is redundant. However, it is more than mere ornament now, as we shall see. 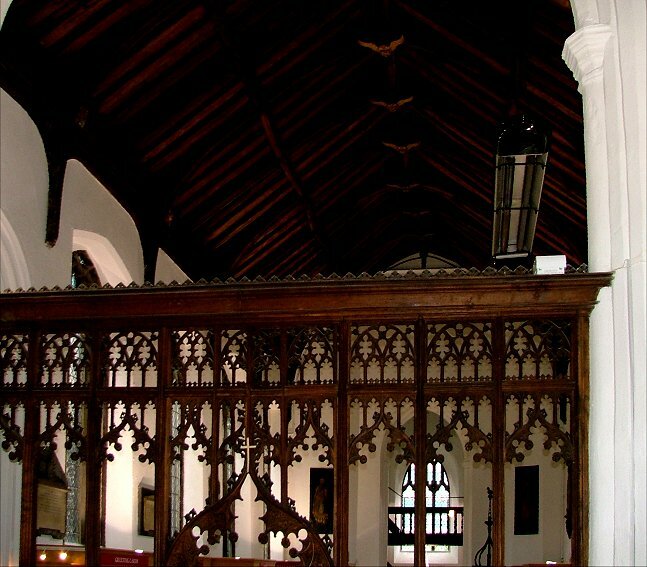 The porch is a stone addition to a flint nave and chancel. 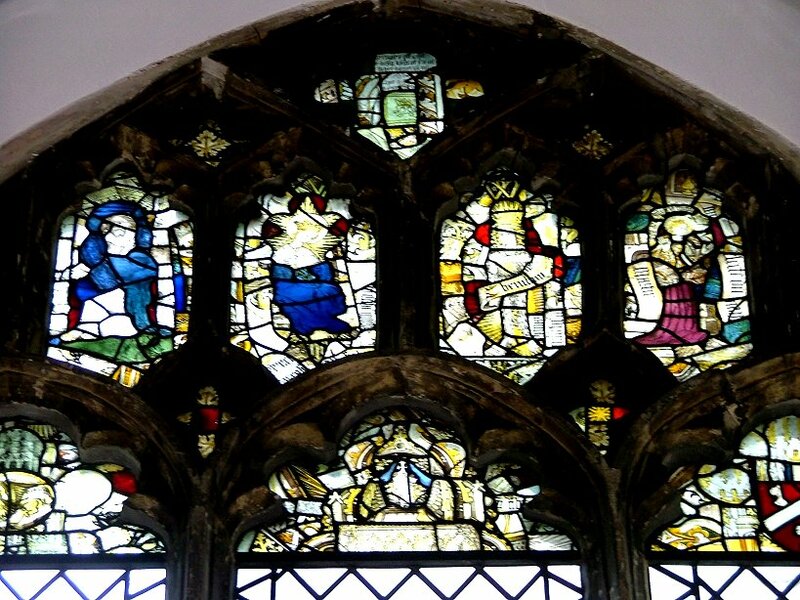 If the nave windows are anything like the original, then we may assume this porch to be quite late, possibly early 16th century (ignore the niches, and pretty much the whole top stage altogether - they are a Victorian affectation). 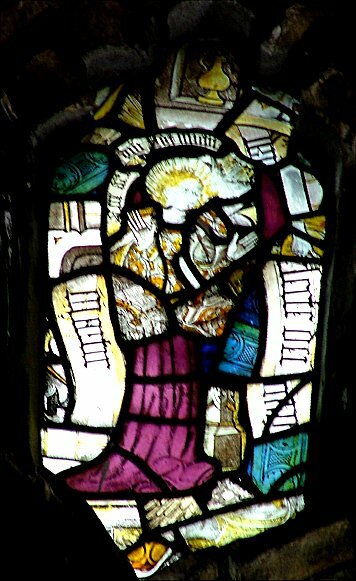 St George and St Michael fight dragons in the spandrils, very much as at Colby in north Norfolk. 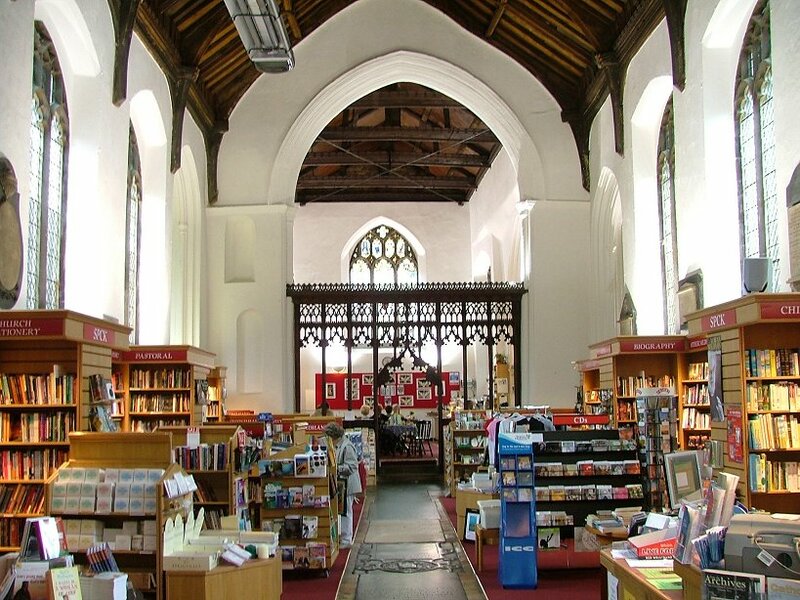 Curiously, the porch lets into the base of the tower rather than into the nave, possibly because it lined up with Bank Plain before the current street pattern was put in place in the early 20th century - before that, there was no road to the west of the tower, and Bank Plain curved round into Queen Street. 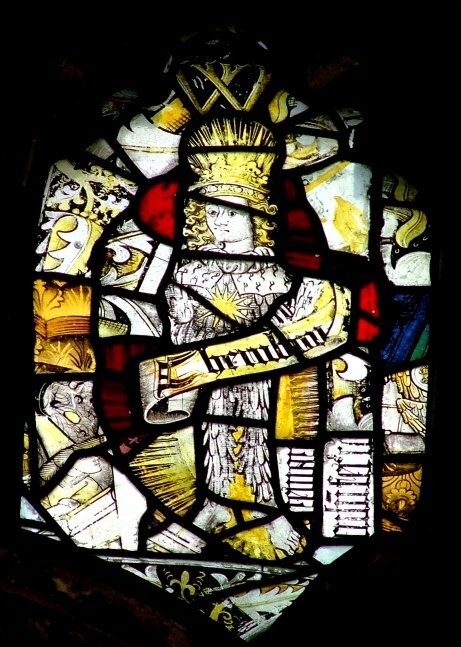 The medieval screen from St Michael is now in the cathedral, but there are a few fine medieval survivals in the form of glass set high in the lights of the east window. 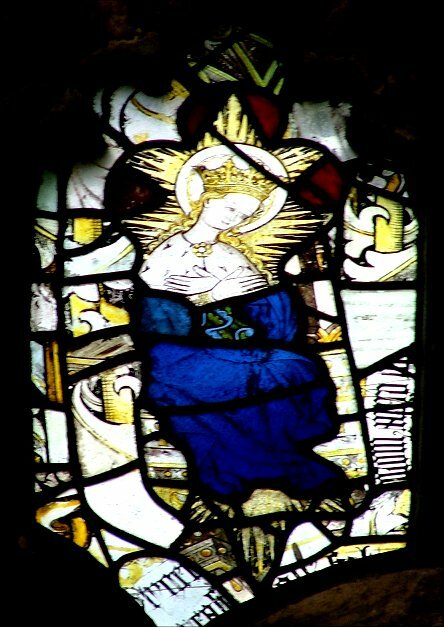 These include a beautiful Mary that probably came from an Annunciation, and an angel that has been given the head of Mary from a Queen of Heaven image. 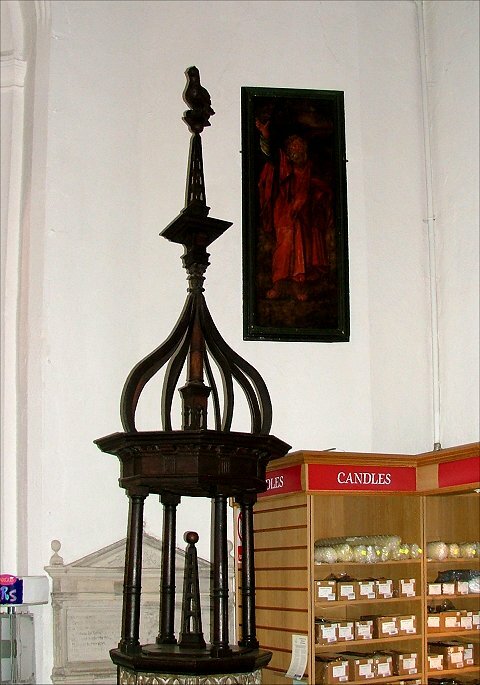 A 17th century font cover sits on a somewhat understated 15th century font. 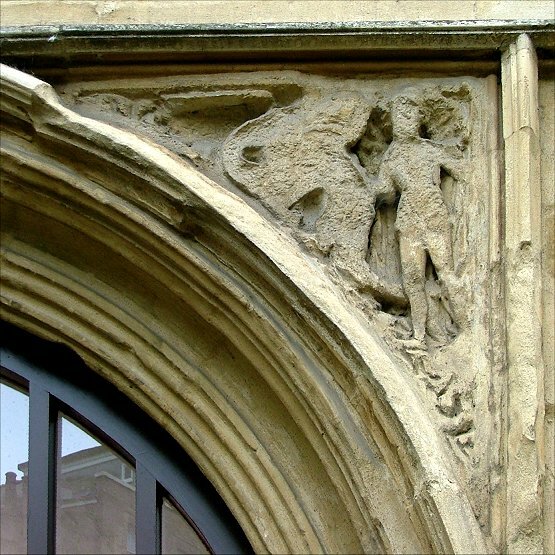 On the west wall of the nave either side of the tower arch are 17th century paintings of Moses and Aaron which once flanked the Ten Commandments in the east end of the chancel. 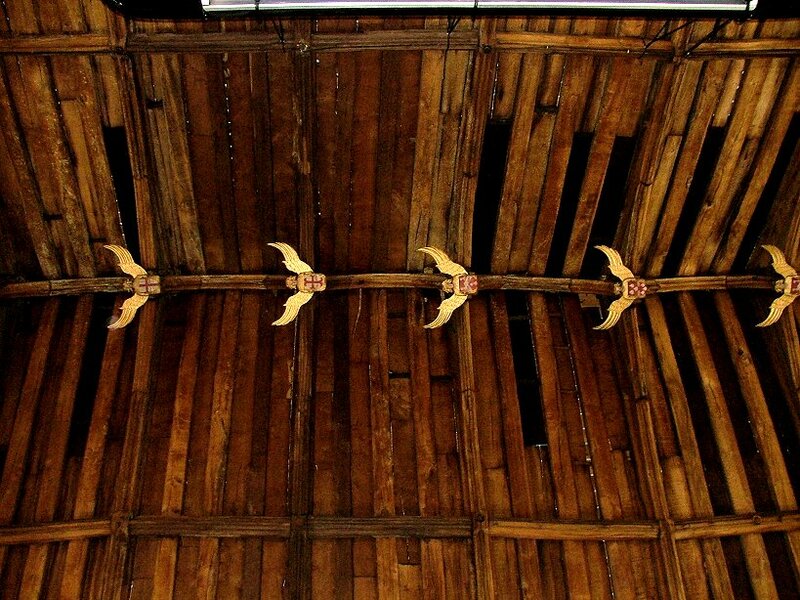 Overhead, angels in flight line the apex of the restored roof. 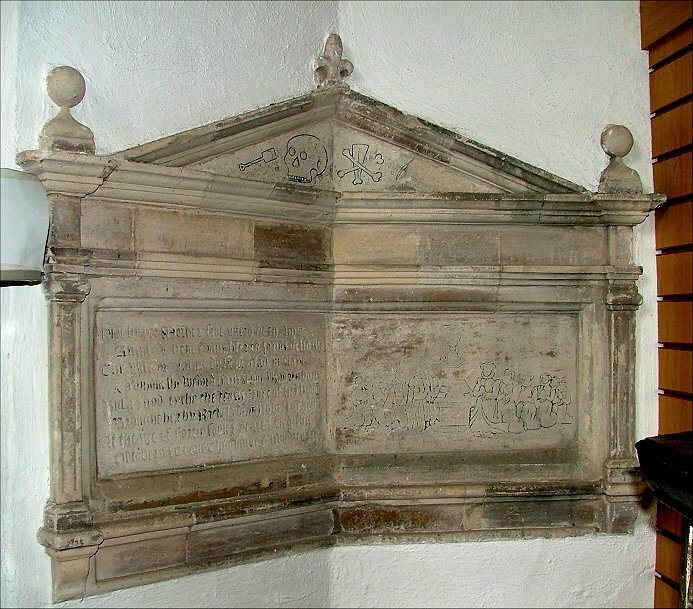 Perhaps the most memorable internal feature is the early 17th century memorial at the north-west corner to Jacques de Hem. 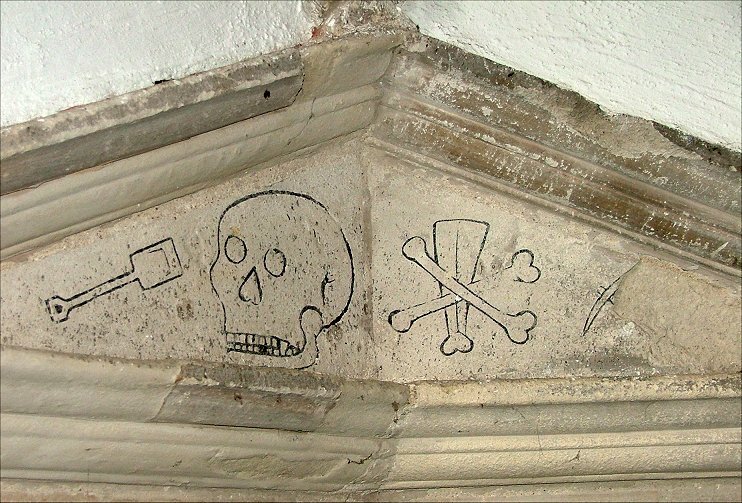 It consists of two stone blocks put together at an angle, and all the features incised and then coloured in black, as if this was a brass: de Hem and his family kneel piously in the bottom right hand panel, while above there are a spade, a skull, crossed bones and a pick as a useful reminder to us of our own mortality. 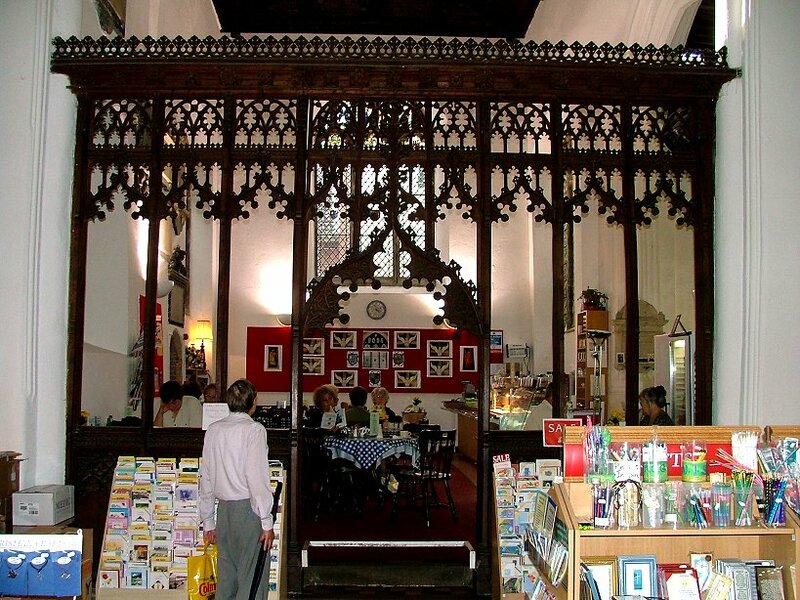 The chancel has been converted into a pleasant cafe that is a good place to stop in an increasingly expensive city. 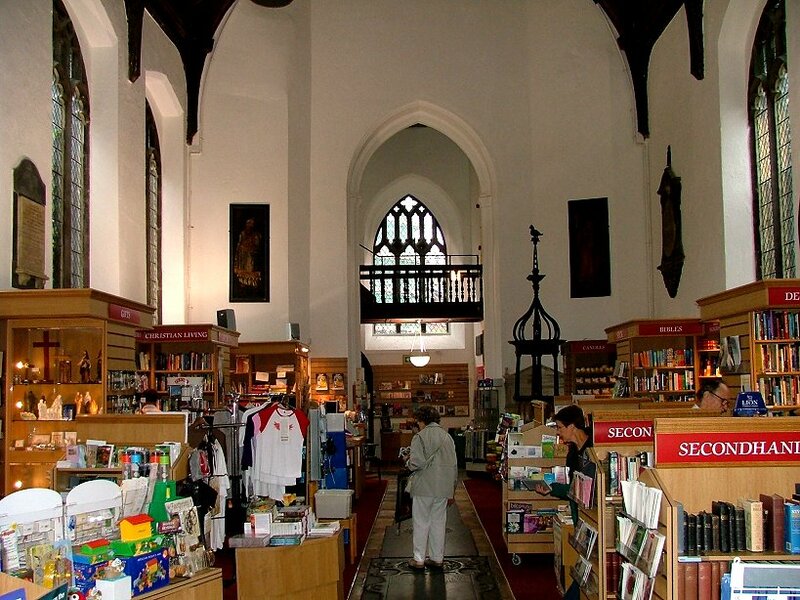 For a long time the nave was an antiques market, and it included a cracking second hand book stall; but today these are gone, and in their place is a rather serious SPCK bookshop. Very worthy, no doubt, but I do miss the old days.